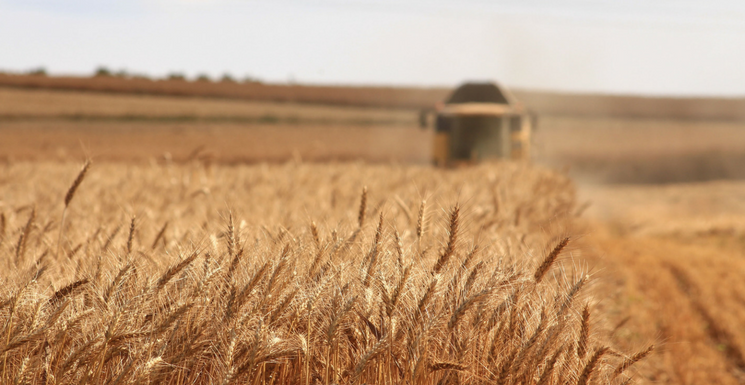 We could write a blog about harvest safety tips (here’s a great checklist) or how to prepare your machines for harvest (this one is good, too), but chances are you’ve been a farmer long enough to know most of those things by heart. Farmers know where to find advice and instructions on how to keep their machines in good order during harvest season. What they don’t always know—or do—is take care of themselves during this busy time of year. Whether you are a farmer, or take care of one, these seven tips will help make sure everyone weathers the long hours, stress, and grueling physical activity this season can bring. While coffee, beer, and Coke all count toward your daily hydration, they also deplete it at the same time. Offset the fluid loss by drinking twice as water; that’s right, for every cup of coffee you’ll need two cups of water to replace it. You’ll be more alert during the day, help flush your body of the dust and fumes you’ve been inhaling, and sleep better when you finally pull in. Bring a jug that holds at least a 1/2 gallon (more if it’s hot), and aim to finish it by the time you pull in. Stretch your legs as often as you can. Sitting for long hours in farm equipment can wreak havoc on your back, neck, and cardiovascular system much like sitting at a desk job can. Take advantage of breaks. Stretch, walk, and move as needed to keep your body healthy and alert. Moving around helps move lymph and resources around the body to help you avoid sickness and fatigue, and it gives your heart a chance to kick it into a higher gear. Use caution during heat and humidity and while around active equipment. This may sound like your mama talking (who are we kidding, it’s all of our mamas talking), but your lunch should include at least one fruit and one vegetable. And no, potato chips don’t count. Throw some apples, nuts, seeds, and carrots in the cab with you, and you’ll have enough to tide you over until your next break. They’ll add to your hydration and give your nutrition a boost while you’re at it. Did you know that being overtired can create a similar impaired mental state as intoxication? While most farmers wouldn’t consider operating their huge, expensive machinery while drunk, many don’t think twice about sitting in the cab for more than 15 to 20 hours. Here’s where we tell you it’s time to think twice about it. If you must burn the midnight oil, take plenty of naps in between, find another person to relieve you, and give yourself at least 6 hours of good, uninterrupted sleep a night. Make a point to work as long as the sun does, and then wind down from there. Before you share the road with the public, make sure all lighting and flashers are working properly and USE THEM. Don’t forget your slow-moving vehicle sign on the back of your equipment, be careful of soft shoulders, and stay alert. Always be on the watch for tractors and machinery, especially since they could be entering or exiting the road from an unexpected place, like a field or driveway. This goes without saying: Don’t text and drive. Farm machinery travels at less than 25 mph. It cannot go faster. Be patient. Good food takes time. Keep a safe distance so they can see you and you can see around them. Give slow moving vehicles the time and space they need to turn. Don’t honk at farmers. Wave and thank them. Stock your first aid kit. It may seem overly cautious, but so are most things until you absolutely need them. All farm vehicles should have a stocked first aid kit—with tourniquet—handy. Farmers work around some pretty impressive and dangerous equipment, and there’s a good chance you know at least three people who have been severely injured, or worse, by PTO shafts, grain augers, and dryers. Put it in a secure spot and keep it replenished and up-to-date. We hope you never have to use it. Keep checking in with your support system. It’s easy for farmers to put their blinders on during harvest season. There is a lot to do in a short time frame, and the stress can be remarkable. Take a moment to check in with your family and your crew. This could be as simple as letting them know your plan for the day or thanking them for the hard work they are doing or the lunch they made you. Apologize when you get snappy. Be clear about what you need and when. You may feel alone in the tractor or combine, but you most certainly aren’t; just remember harvest takes its toll on everyone, even as you reap its benefits. Any other tips for first-time or long-time farmers? We’d love to hear them! Have a safe harvest season from all of us at Ragan & Massey!